The takeover of Newport Gwent Dragons by the Welsh Rugby Union (WRU) needs to be done quickly, according to the region's chairman Martyn Hazell. Talks between the WRU and the region are at an advanced stage. The union owns a 50% stake in the Dragons, with Newport RFC owning 50% but Hazell says any deal would see the WRU take full control. "It's getting to a point where it has to be done in the next week or it won't be done at all," Hazell told Scrum V.
"We are still in discussions with the WRU. It seems a case of one step forward and one step back at the moment. "They are not big sticking points, they are small things and I'm sure we can get over them. "Hopefully it will be completed over the next few days." The WRU did not reply when approached for comment. The Dragons are one of four Welsh professional regions and are currently 10th in the Pro12 table with just four wins in 17 matches. Businessmen Hazell and Tony Brown have been putting money into the region since it started in 2003, a situation he said cannot continue. He believes any takeover would mean then WRU taking complete control of the region and the Rodney Parade ground with the Dragons and Newport Rugby Club guaranteed to play there for 10 years. "I can't see that we can do any more than hand it over in a reasonable shape to our Union," Hazell added. "The future of the Dragons is that myself and Tony Brown can't keep pumping money into it. We're both turning 80 within the next few weeks and we can't keep doing it. "But we're desperate to keep rugby going at Rodney Parade after 175 years." Hazell added that a deal would see him and Brown writing off debts. 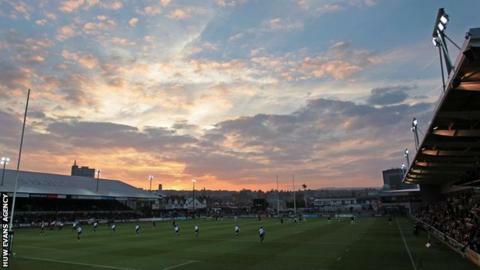 "If we insisted on having the debt paid then that would be the end of rugby at Rodney Parade," he said. "We want to leave the Dragons and Newport in a comfortable position. Unless something else came along then the future would look bleak." Any deal would have to be approved by 75% of Newport RFC members, but Hazell believes they would vote for a deal as in his opinion there was no viable alternative. Once a deal is approved he would expect the WRU to relay the troublesome Rodney Parade pitch and conceded they could drop the Newport Gwent part of the name in favour of plain Dragons - like the Scarlets and Ospreys. "That's fair enough. I've always thought Newport Gwent Dragons was a mouthful," he added. "I think the Union would like to take over all four regions and follow the Irish model. "That's the only sensible way to do it because benefactors like myself and Tony Brown are either retiring or dying."